Hand shape lends it's self to a "Helping Hand" theme that is useful for attorneys, and home health services. Features of the promotional jar opener are quality rubber construction with molded grip dimples. Jar openers are poly bagged with a clear view window showing your logo. 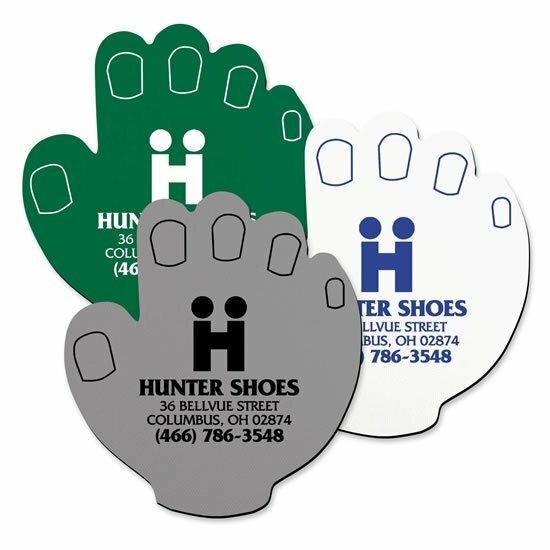 Stock hand shape art is included, printed in the same color as imprint. The overall size of the hand jar opener is 4 3/4" w x 5" h.
This promotion product is Made in the USA. The price includes a one standard color print on one side in an area 3" w x 2" h.
color add an additional screen and a run charge of $.20 each unit. A minimum of a 1000 unit order is required for a two color print. Promotional jar openers have a maximum of a two color print.